Go ahead and admit it: You're a mega Meghan Markle fan. I think we can all agree that the duchess has one of the most sought-after wardrobes. After all, she's known for spiking sales by as much as 1000% and making items quickly sell out after she's spotted wearing them. That's where we come in. After dutifully stalking her wardrobe choices and ID'ing her outfits at every turn, we're pretty well acquainted with her favorites, and now that all the January sales are upon us, we've spotted several Markle-approved deals that are too good not to share with you. 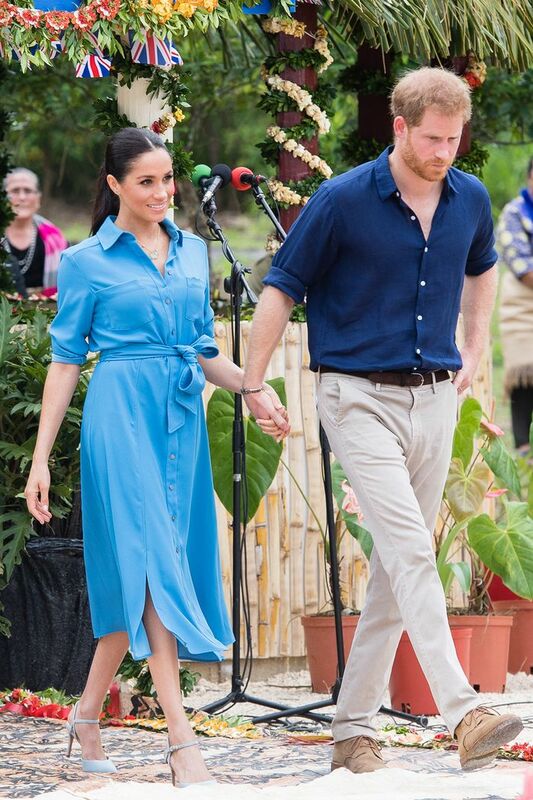 During her royal tour Down Under, Markle wore a belted shirtdress from Veronica Beard that, while no longer available in the cerulean shade she chose, is on sale in an equally stylish red version. The Altuzarra blazer and white Veja sneakers she also wore while in Australia are priced at a healthy discount, too. Keep reading to see and shop everything from Markle's closet that's currently on sale. Now, see the chicest coats the duchess has ever worn.